Today's Inspiration: Christmas Ski Party? Colliers December 1955, originally uploaded by leifpeng. 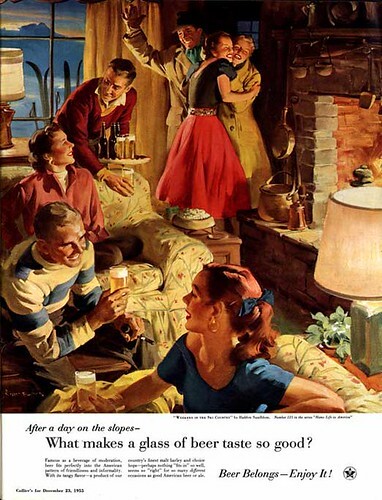 Ok, I know its a stretch, but hey - this ad was in the December '55 "Special Christmas Issue" of Colliers so we must trust that the United States Brewers Foundation and its ad agency knew what they were doing when they chose this image for that time slot. I wanted to include a Sundblom in the Countdown to Christmas but his Coca Cola santas have been reprinted so often there didn't seem to be any point - you've no doubt seen them all! If not, there's one ( and a few other Sundbloms ) in my new TI Flickr archives here. One thing I cannot stress enough to American appreciators of Sundblom, is the fact that his last name is pronounced "sund-bloom". Thanks anonymous. And in fact that "bloom" pronunciation is the reason I always have to double check my spelling when I write his name! leif, I am on your mailing list and had not had a chance to visit your blog. You said, "I wanted to include a Sundblom in the Countdown to Christmas but his Coca Cola santas have been reprinted so often there didn't seem to be any point - you've no doubt seen them all! " I have not seen them all! Thanks for posting those 5 large ones! Which brings me to - am I getting the largest size if I am on your mailing list? Finally is there a Sunblom BOOK or website - I want more Sunblom! Love your flickr group too! Oh! And further to your question Daniel, the size I send out each morning to the group is the largest size - however, if you ever see an image that you want an even larger size of, I keep a 300 dpi version backed up. I will gladly send that version out by request to anyone on the list. 300 dpi - awesome, I'll have to look through my collection of yours and pick out my favorite! Yeah, at almost $90, that book it out of reach for me. After Christmas those same sellers may lower it. I was going to bid on it on eBay last week, but I wasn't sure if it was top quality - I guess it is. and Issue no.1 has a "Must Read" Sundblom article with pictures!!! And the first 6 issues are available for free as download - pdf. If anyone wants to go in half on the 'Dream of Santa' we can tear it apart and scan the images! I love books, but having quick reference to this images is inspiring when working! If anyone subscribes to Illustration-Magazine tell Dan Zimmer (the publisher) I sent ya! Well Daniel, your enthusiasm is commendable but please don't go tearing books apart! Yikes! perhaps someone will offer to share the cost if one person scans it and the other keeps the intact book on their shelf. I don't think dan Zimmer would mind me telling that he has been on the Today's Inspiration list for a long time now. He's doing good work to keep classic illustration in the front of the public's mind and I urge everyone to click on the link in my sidebar and visit his Illustration Magazine site, and buy Illustration magazine - its money well spent! I looked for years for a complete book of Haddon Sundblom's Santas and found one published by Staples and Charles in 1992. They only produced "soft bound" editions of the book. I bought directly from the publisher at $20 a book. Then they sold the publishing rights to Gramercy and they produced it as a hardback book. I bought one copy for $10.99. But it appears that it is now out of print and on Amazon, they want from $145-$191 for "used" ones!! But if you look further, you will find that the "soft cover" book by Staples and Charles can still be obtained for $30-35. There is only 1 year of the Santas that is missing in this book and I am not sure why that is. But if you are just looking to have a collection of his Santa works, I would strongly recommend the "soft cover"....identical to the hardback and was actually produced before the hardback. Why the later edition sells for such higher prices is hard for me to understand? ?